This assignment was for Miner Rail Car, manufacturers of high end mass transit and rail products. 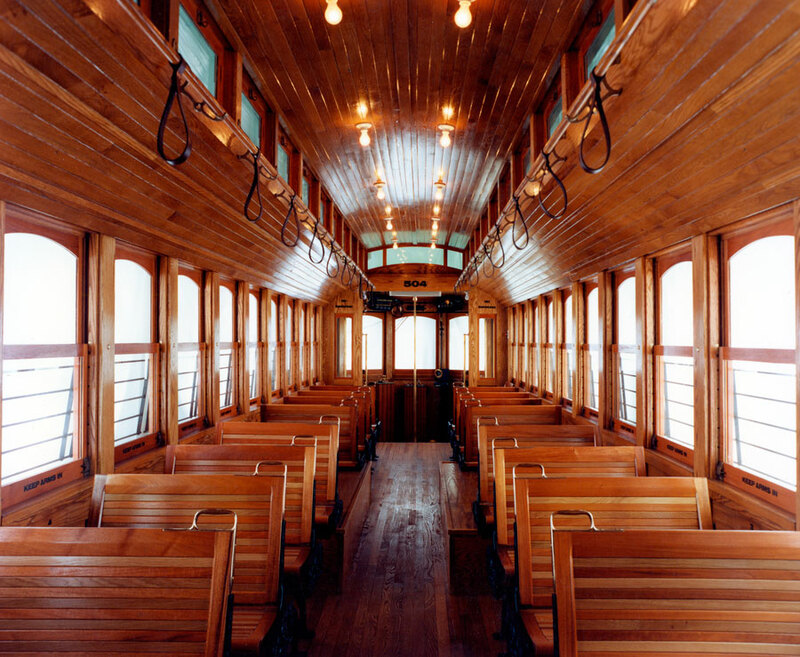 These Galveston Island Trolleys are a diesel powered, rail riding reproduction out of the past, much like those that provided mass transportation before buses and private automobiles took over. The purpose of this particular shot was to emphasize the beautiful interior, hand crafted from oak and cherry woods in painstaking replication of the best of old-fashioned craftsmanship. We also photographed the exteriors, all the mechanical workings, construction progress report photos and the images needed for instruction manuals and maintenance. In addition, we produced, scripted and narrated a documentary video. Due to production schedules and delivery deadlines, the photograph above took place under enormous pressure on less than 24 hours notice – at night – so we could manage the exterior views. Surrounding the trolley were typical rail yard construction elements – i.e. scrap metal and other projects in various states of welding, painting and fabrication. This was the last of four cars produced, so the deadline was very real. The others had shipped so rapidly that no finished interior photography ever took place. The exteriors and mechanicals had been done as we went, but there were no interior beauty shots, as yet. To create the effect of bright afternoon sunlight through the windows, the trolley was completely wrapped in hundreds of feet of 90″ wide white cloth. Great care had to be taken to ensure absolutely no damage to the car since it was shipping the next morning, without fail. It had just been painted, so our client was concerned that the paint might still be scratched easily. This required my assistant on this, Bill Lyons, and I work in stocking feet on a January afternoon. Obviously we wore several layers of winter socks, but we were quite cold before we finished draping the car in white. We couldn’t use tape for the same reason we were stocking footed, so we used many lengths of soft cotton rope, tied to the cloth and connecting across the top of the car to the cloth on the other side. This made a sort of tent around the sides. Later, after dark, we used studio strobes flashed through each window to create what you see above: the appearance of a bright sunny afternoon light cascading over the beautiful hand worked interior. I’m proud of this shot, it was technically and logistically challenging. More importantly, the client was thrilled. It met their needs perfectly, was on time, on short notice and on budget. This is what we do: photographic problem solving. Let us know how we can help you. For outstanding professional photography, call me at 724-730-8513. Lets see what we can do for you. « Firestone’s Market – Sandwiches to Go-o-o-o!